As we swing into the New Year, many are going to be feeling more than a little impatient that the perpetrators of the toxic air-born emissions which create engineered clouds over vast areas of our skies, still remain largely anonymous. Anonymous by name, but no doubt to be found within the ranks of military industrial proponents and psychopathic secret society hegemons: those who hide behind the 1991 Hughes Aircraft atmospheric aerosol patent. The patent that formalized an engineering technique which alters the climate and sickens the planetary population with its debilitating fall-out. There is a red line test that almost instantly reveals people's awareness about these, and related, military activities. Just put the question “What do you think about 9/11? And how do you feel about chemtrails?” You might be surprised to find that those who you consider reasonably intelligent and quite thoughtful individuals, appear to be neither when asked to think about these two actualities. This response to the first question would be quite typical “It's obvious, 9/11 was an al-Qaeda mission led by bin Laden. There's nothing suspicious about it.” And on chemtrails “They don't exist”. What one runs into when confronted with such an unquestioning response, creates a genuine human dilemma. Where can one turn if fellow human beings are unwilling to examine, in any detail, incriminating evidence that stands behind such crime's against humanity? However, things take on a vastly magnified significance once one seeks to solicit the truth from those well placed to actually know something about what goes on in the higher echelons of military defense planning, or amongst those concerned with environmental protection, weather forecasting and civil aviation. The silence in these quarters is deafening. Atmospheric aerosol geoengineering (chemtrails) is one of the most crudely in-your-face debasements of civil justice and environmental and human health, ever to have been enacted upon mankind – outside of outright war. Even if one thought it might be happening as some form of defense against 'global warming', one could hardly fail to realize that nobody ever asked if you, or anyone else for that matter, were in agreement for such an experiment to be undertaken in the sky above your home, and from one end to the other of your country of residence. The mind tries to grasp how it could be that the smothering of our skies with toxic engineered clouds, a process that has been going on for at least two decades, could fail to elicit any response from the majority of mortals living on planet Earth. Yet most claim 'not to have noticed' these activities, and others have told me “I never look up”. What an indictment concerning the state of imprisonment that great swathes of humanity try to make their peace with. So what do we actually know about the manufacture of these aerosols? Who is behind them – and how are they dispersed in the atmosphere? In short, we know that in 1975 the US navy was granted a patent which describes the dispersion method for a 'powdered contrail' able to sustain itself in the atmosphere for long periods. And in 1990 the US Department of Defense used the word 'chemtrails' as the title of a chemistry manual for pilots attending the US Air Force Academy. A manual that teaches how to make these aerosols. This is verifiable information in the public domain - so that does away with the 'conspiracy theory' factor straight away. We know, from public records, that airborne chemical spraying – in one form or another – has been going on for at least sixty years. Early examples include cloud seeding during World War Two and in Vietnam during the US invasion of the late 1960's. Atmospheric geoengineering has come about and continues to operate, as a military project. In the 1980's it became known as an 'Environmental Modification Weapon' (En Mod), and due to the widespread controversy this aroused, such techniques were banned under the auspices of UN Convention on the Prohibition of Military or Any Other Hostile Use of Environmental Modification Techniques, 1987. However this UN edict is not enshrined in law, and it is quite clear that whoever is behind the atmospheric weaponry, is not unduly phased, and continues to order the mining and smelting of vast tonnages of aluminium as well as other components such as barium and titanium; to be processed into a substance which is then spread around the world via aircraft flying at around twenty five to thirty thousand feet. If anyone 'official' has anything to say at all about this activity, it is that “there is some discussion about using geoengineering techniques to counter the affects of sunlight as a cause of global warming.” We know that British and US governments have, since 2009, been 'discussing' the use of geoengineering to combat climate change via the spreading aerosols in the atmosphere. In recent years more and more independent research projects, both in Europe and the USA, have revealed the presence of aluminium, barium and titanium in water courses far from any likely factory processing zones. In Germany and Switzerland recent research has revealed alarmingly high levels detected at many sites; and in France nanotech chemtrail 'filaments' have recently been recorded at locations all over the country. Most of what I have described up until now is not new knowledge, but needs repeating so as to remind us of the extent to which the chemtrails phenominum has become a ubiquitous feature of modern life. But why, given this fact, haven't we nailed the perpetrators years ago? How could something so deadly be practiced on a global scale and yet manage to remain almost completely unidentified at source? For example, how many millions of tons of alluminium are used in the course of a year's spraying? Where does it come from? Who organizes the shipments – the processing and the delivery to airports? How come governments remain totally silent? The answer to these questions – that are out there – remain sketchy. Maybe because just a handful of dedicated self resourced activist researchers have, up until now, led the way in identifying just about all we know about these activities. That needs to change. Many more need to be involved and the exposure needs to be ramped up ten fold. There is still some controversy concerning exactly how the spraying is carried out. What technology is used? Who fits it? Is it fitted to military and civilian commercial jet airlines ? And if so – how many people working in the industry know about this, but remain quiet? 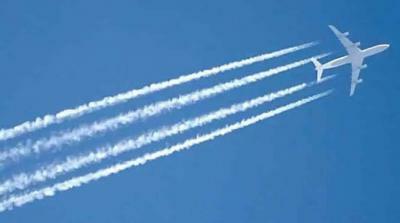 I have been researching atmospheric aerosol geoengineering for the past ten years or more*(see end) and I have increasingly come to suspect that the high altitude dispersal method is achieved via mixing nanoparticulates into jet fuels and thereby into the exhaust gases of the aircraft's jet engines. Observation alone, shows that the majority of trails start from the exhaust gases expelled at the back of the engine. The fact that there are many reports of pilots becoming unconscious and passengers getting sick, due to fumes entering the cockpit and cabin, bears testimony to the existence of some highly toxic substances circulating around the fuselage of modern passenger aircraft. The air conditioning units in such planes are powered by the engines. What exactly is the composition of the fuel going into these engines? A recent study by the Swiss Federal Institute of Technology, Zurich, aimed to ascertain the composition of the exhaust fumes directly they leave the turbines of high flying jet aircraft. What the initial study found was very revealing: there were sixteen different metals detected in the composition of the engine exhaust – and they included aluminium and barium. Now anyone with an ounce of intelligence is going to ask why would aluminium and barium be added to commercial jet fuels – not to mention the other fourteen metals. We already know that 'overt' spraying is carried out by by specially adapted aircraft into which special tanks and equipment are installed, with spraying nozzles fitted externally. Engineers have photographed such apparatus in the fuselage of planes they have worked on, and these pictures can be found on the net. But this form of 'overt' spraying cannot account for the large number of planes which spread the 'covert' aerosol trails that cover our skies, year in year out, from one end of the world to the other. There has to be a vast network of internationally interconnected fueling bases involved in order for an operation of this magnitude to be realizable. Only a highly sophisticated and globally managed operation could mastermind chemtrail activity on this scale. It is highly probable, that standing behind this operation, is the same psychopathic secretive cabal that is behind all such manipulative global missions. Behind all attempts to take control of the planet and exert 'full spectrum dominance' over humanity as a whole. A cabal which is familiar with mind control techniques, genetic modification of the food chain and the pharmaceutical repression of natural health. The existence of aluminium as a vaccination adjuvant has already been widely exposed. Its addition to airline fuels has not yet received the same attention – but clearly needs to. Barium and strontium, the two other widely identified elements detected in water samplings, have equally damaging and degenerating neurological and internal organ repercussions, on both human and animal health, as well as a dangerously repressive affect on plant health. The almost continuous toxic barrage, which all species are subjected to, represents a direct threat to the gene pool upon which all life on earth is predicated. Let's make 2018 the year in which the brutality of chemtrail activity is decisively brought into the foreground of people's attention worldwide; and let's ensure that we can finally name the names of those behind this mass genocide. A genocide affecting every aspect of the unique biological diversity of our beloved and beleaguered planet Earth. Foremost in our minds this coming year, should be the need to achieve the complete eradication of atmospheric aerosol engineering and an end to the secrecy which enables such heinous projects to ever get off the ground. Julian Rose is an early pioneer of UK organic farming, a writer, actor and international activist. He is President of the International Coalition to Protect the Polish Countryside. Julian is the author of two acclaimed titles: Changing Course for Life and In Defense of Life, which can be purchased by visiting www.julianrose.info . He has just completed his third book 'Overcoming the Mechanistic Mind' for which he is currently seeking a publisher..